There has been a growing trend of late to try to revitalise brands by tenuously affiliating them with video games. American gamers have been wooed with snacks, soft drinks and (erm) shaving products which are somehow conducive to the gamer ‘lifestyle’. The people at the Guinness Book of World Records (presumably facing dwindling sales in the lean years since Kriss Akabusi and Cheryl Baker kept record breaking high on the cultural agenda) decided to jump on the bandwagon last year, with the Guinness World Records Gamer’s Edition. Now in its second edition, the book may be a more legitimate attempt to appeal to gamers than razor blades and fizzy water, but there are still some significant problems with the implementation. On the face of it, the concept of a book of gaming records is a sound one. Competitive gaming records (i.e. high scores) have in fact been covered by a book called Twin Galaxies since the 1980s, which is the source of most of the records of this nature in the Guinness book. 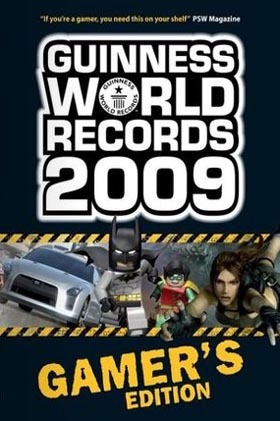 However, as a book consisting solely of tables of numbers would be boring to Guinness’s youth demographic, their team of researchers have relaxed the definition of a ‘world record’ to cover lots of sales figures and other bits of gaming trivia. The problem with this approach is that to obtain usable information (as well as screenshots and artwork, and possibly access to developers), Guinness have had to approach publishers’ PR departments. Publishers generally don’t employ full time historians to field less obvious enquiries, and inevitably a lot of the information that they’ve been provided with is more concerned with promoting their current slate of releases than accuracy or suitability for a book of this type. Any SCUMM fans reading this will already know that ILM and Lucasarts first collaborated over a decade earlier on The Dig, and a quick Google reveals that there have been several other Star Wars games predating SW:TFU which also fit the description. This might not be a fact that’s common knowledge, but it should have been very, very easy for the editors to at least check. Elsewhere rather dubious ‘records’ are awarded (“First Nintendo GTA game”, “First Wireless Bass Guitar Peripheral”, and apparently “First Downloadable Content For Mass Effect”! ), and there are spreads on specific games and franchises, carefully expunged of any references to competitor’s products. The whole exercise has the feel of an industry award ceremony where the event sponsors are each given a tailor-made category they’re guaranteed to win. (“And the award for Best Sub-$2000 Lawnmower from a Company with M in Their Name goes to…“) It’s not clear whether any money changed hands for certain games to secure coverage in the book, but in a way that’s less important than how the material has been presented. The book also includes a fairly suspect “Top 50 Console Games” list, which (among other issues) is inconsistent in its treatment of franchises versus individual titles and has already had a fair amount of scorn poured on it by the specialist press. The fact that this kind of sloppy work is being put out under the Guinness World Records brand makes it all the more jarring. Guinness’s reputation is based on the perception that they take records very seriously, ensuring that attempts are carried out under controlled conditions, and that reported records are scrupulously checked for any signs of trickery. Having a Gamer’s Edition which is little more than a glorified catalogue sends the message that in their eyes games aren’t Serious Business in the same way that pulling trucks with your teeth and wearing beards of bees are. This isn’t to say that the book is entirely without redeeming features. The ‘proper’, verifiable records (biggest, longest, highest, etc.) are sometimes interesting and surprising as those in the non-gamer’s edition, and the sheer density of information on historical and modern games would make the book a good resource for kids and parents who probably don’t buy games magazines or visit specialist games websites. It’s also reasonable to assume that a lot of the problems with the book are more down to the compilers’ unfamiliarity with the subject matter than more cynical reasons. A good comparison would be the games BAFTAs, which while still far from perfect have become much more credible than they were when they started out about ten years ago. As Guinness seem to be committed to the project in the long term, I hope they’re taking on board feedback from gaming enthusiasts to improve the next version. With the (relatively inexpensive) involvement of some contributing editors from within the industry, the book could be transformed from a trend-following cash-in to a more credible, dependable reference work that would appeal to adults (who make up most of the gaming population these days) as well as kids.